This security poster illustrates the Tellermine 35 & 42 Germany Anti-Tank Mines. These WW2 designs used features integrated into many of the types of metal anti-tank mines constructed in the period after the war. Both types of these anti-tank mines are of metal construction. Many of these anti-tank mines were laid during the war and can still be encountered today. 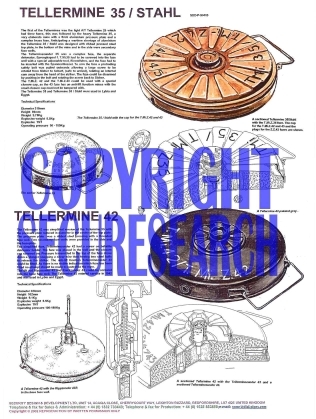 This security poster features a sectioned Tellermine 42 with the Tellerminezunder 43 and a sectioned Tellerminezunder 43, a Tellermine 42 with the Kippzunder 43B in the base fuze well, a Tellermine 43 painted gray, the earlier Tellermine 35, a sectioned Tellermine 35/Stahl with the T.Mi.Z.35 fuze, and the Tellermine 35/Stahl with the cap for the T.Mi.Z.42 and 43. The security poster also shows the technical specifications of both the Tellermine 35 & 42 Germany Anti-Tank Mines. The Tellermine 35/Stahl with the cap for the T.Mi.Z.42 and 43. A sectioned Tellermine 35/Stahl with the T.Mi.Z.35 fuze. A Tellermine 43 painted gray. A Tellermine 42 with the Kippzunder 43B in the base fuze well. A sectioned Tellermine 42 with the Tellerminezunder 43 and a sectioned Tellerminezunder 43. The technical specifications of both the Tellermine 35 & 42 Germany Anti-Tank Mines. This security poster features the technical specifications of both mines, a sectioned Tellermine 42, a Tellermine 42, a Tellermine 43 painted gray, the earlier Tellermine 35, a sectioned Tellermine 35/Stahl, and the Tellermine 35/Stahl.